Homemade goodness … Tofu, anyone? It’s getting cool here in Belgium, and there’s nothing more satisfying than a pot of red lentil, cauliflower, carrot soup (that was Saturday, sorry, no photos .. it was gone before I realized I hadn’t taken a photo!). Today, however, courtesy of my flatmate, is the above goodness. 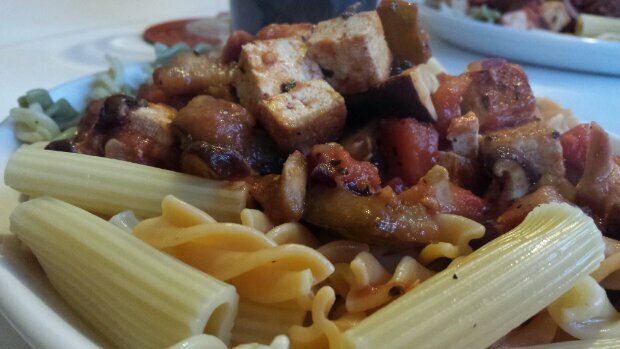 Hearty, saucy, slightly spicy wok sauteed tofu, sundried tomatoes, shiitake mushrooms with spiral pasta and a few rigatoni thrown in for good measure. 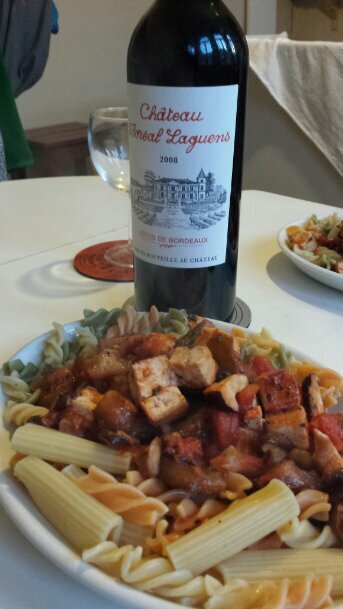 Top that off with a glass of Côtes de Bordeaux, and we’ve got a winner! This weekend, I thoroughly intend to make a gorgeous pot of NOLA red beans. Wish me luck!